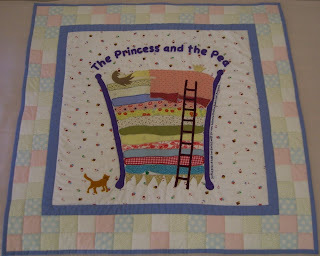 I was asked to make a wall hanging / play mat based on the tale by Hans Christian Andersen The Princess and the Pea. Can you spot the naughty green pea that made the Princess so uncomfortable all night? 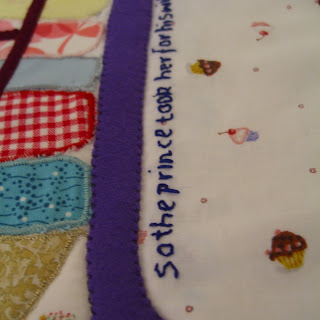 There is one particular line in the tale that I love 'So the prince took her to be his wife, for now he was sure that he had found a real princess' which I embroidered up the side of of the bed. I had lots of fun making it - and I thought the perfect accompaniment would be the actual story book of The Princess and the Pea. And this is when I discovered that I'm a bit of a traditionalist at heart. I could not find a traditional copy of The Princess and the Pea anywhere - the picture books have all been 'modernized' - the text is not the same ... it makes me sad that we have to modernize everything. But as I reread the original text - I realized I too had taken lots of naughty liberties with the interpretation of the tale for my quilt! I only made 12 mattresses and not the full 20 ... ... my Princess looks rather neat and tidy and is not in 'a terrible state' ... ... and I assumed the Princess would have had a ladder to get up to the top of the mattress pile ... ... my Princess also has a very friendly orange cat ... ... and every Princess knows she should take off her crown before going to sleep! Perhaps we don't have to be 100% accurate all of the time? Hi! Thanks for taking the time to HOP over to visit The Stone Rabbit! We were on the patio taking photos for Pink Saturday! He says to tell you Hi! I am a rabbit lover, too! I create lots of them for Spring shows from "aged" cotton batting. I also have several concrete ones around the outside and inside of my home! I love all things handmade, too, and I hope when folks buy mine,I hope they know how much love did go into the designing and creating of them! omg this is absolutely LOVELY!! how do you do it? be so perfect? wow. wow wow!! Fab quilt. Great minds think alike JB*JB - I'd spotted the balancing cupcake too. This is flat out fantastic! I enjoyed hearing about your creative decision-making along the way. I do know how frustrating it can be to find the books we knew and loved when we were younger. I spent many frustrating months trying to track down one of my childhood favorites for my kids. I finally found it in a used book store just by chance. Your quilt is gorgeous!! It's so cute! Well done! And yes, everything is modernised.... which in some cases... I think is okay! My husband was reading an OLD book of nursery rhymes to the kids the other day and one of them talked about a naughty child who was going to get whipped by his/her mother!!!! 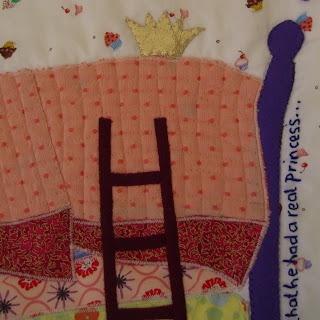 I too love the Princess and the Pea - maybe it's our love of textiles and fabric! 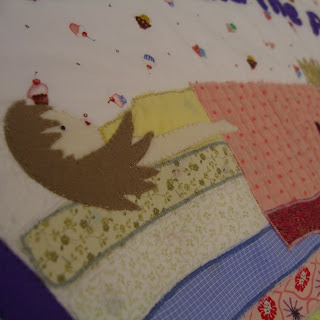 - and pieced a similar quilt earlier this year - but I didn't include such a lovely princess and crown! Lovely present and the book will the perfect touch. Have you checked Amazon? They have a lovely selection including the gorgeous version by Lauren Child - another great love of textiles! Adorable!! 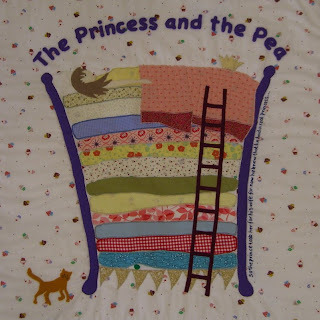 The Princess and the Pea is one of my favourite fairy tales. I love that cat! This turned out really wonderful! beautiful quilt! i'm all for creative freedom!! This is so fantastic. What a great creative take on the tale. I love your fine stitching work as always too. Wonderful job Rachael!! I love it, you did such a great job! This is gorgeous, well done. This is one of my all time favorite stories!!!!! It is beautiful Rachael! Oh my gosh, that is just so beautiful. Once again Rachael you have out done yourself, this quilt is so lovely. 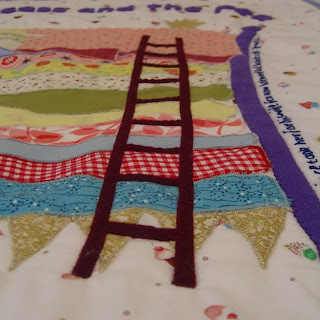 oh i love this, both the quilt and the tale! however, i am wondering how you over there remember our old german tales... nice to see, they are part of my childhood memories! Belinda Downes does a lovely version in the book that she illustrated. Its one of my favourite books. It's utterly adorable! 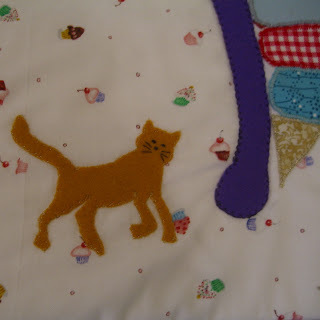 And I recognise the cute cupcake fabric too! When's it's as beautiful as your wall hanging it doesn't matter whether it is modern or traditional. It is a stunning piece of art. Oh Rachel this is adorable. You are just so clever. This is a fantabulous quilt. I've been reading fairy tales to my 4yr old daughter and have just realised how much theft as well as attempted and actual murder there is in a lot of them!! wow! your quilt is amazing. i love it. Why Do Bunnies Have Hoppy Birthdays?